Results from the six-national masters meet in Croatia show Jarmila's monster mark with the 500-gram stick. A couple months before the 2015 Lyon masters world championships, Carol Frost of Nebraska set a W70 world record in the 500-gram javelin. 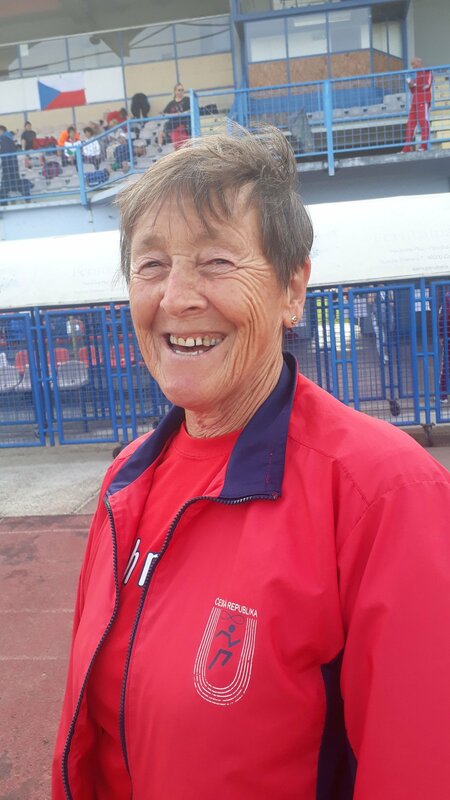 Saturday in Croatia — about two weeks before she competes in Malaga worlds — Jarmila Klimešova of the Czech Republic improved Carol’s record by almost exactly five feet. Jarmila threw 29.32 meters (96-2) at a six-nation masters meet in the Croatian town of Čakovec. Carol’s listed WR was 27.78 (91-1 3/4). Jarmila has been a throws stud for decades. So how did Carol do at Lyon? She took gold with a 25.58 (83-11 1/4). Thus I’ll go out on a limb to predict Jarmila (who shares a name with a two-time Olympic javelinist) will win at Malaga. The only mystery: Can she hit 100 feet? German meet maven Dieter Massin, who shared the javelin WR news, also writes: “This international contest INTERSTATE took place for the seventh time — this time in the Croatian town of Čakovec (near Varaždin). Besides the host Croatia, the masters teams from Switzerland, Austria, Slovenia, Hungary and the Czech Republic were also involved. The exciting comparison was won by Austria (403.5 pts,) ahead of the Czech Republic (375), Hungary (349.5), Slovenia ((269.5), Croatia (217.5) and Switzerland (155). Exciting were also the relays, in which the four runners (men and women) together had to total (at least) 200 years,” he writes. 1 Comment on "Czech Republic’s Jarmila Klimešova claims W70 javelin world record on eve of Malaga worlds"